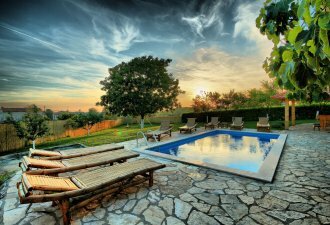 Villa Antoli is a renovated stone house (semi-detached house) located in the village Basici near Tinjan in central Istria, 18 km from Porec and the beaches. The house was built in the early 18th century and completely renovated in 2012, it has an enclosed garden of about 500 sqm with an extremely wide range of facilities for adults and children: swimming pool of 24 sqm, heated "walk in" whirlpool of 12 sqm, slide, swing, trampoline, 2 covered terraces with table and chairs, 4 bicycles (included), summer kitchen with barbecue fireplace and a smaller playroom with air hockey and videogames. Thanks to its favourable position and the given facilities is Villa Antoli an ideal holiday house for an amusing family vacation in Istria. Villa with pool for 8-10 people with a total living area of 180 sqm on three floors, consists of a ground floor on two levels in which we find a fully equipped kitchen, dining room, living room with pool table and fireplace, one bathroom/toilet and one double room with air conditioning, satellite TV and shower/toilet. On the first floor there are two bedrooms, each with a double bed, air conditioning, satellite TV and shower/toilet, one with extra bed. On the second floor (high attic) there is a spacious double room with a double bed, air conditioning, satellite TV, an extra bed and bathroom/toilet with hydromassage bathtub.